Spaghetti Puttanesca – make this classic Italian dish at home. 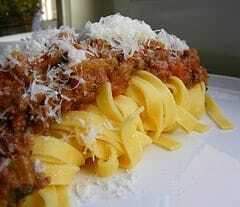 Home » Favorite Recipes » Spaghetti Puttanesca – make this classic Italian dish at home. An authentic Italian recipe! This dish is originally from Southern Italy. It is my family’s favorite because many of the ingredients are added just before serving and it gives me the benefit to please all by keeping the black olives out of mine or the anchovies out of my daughter’s. My husband likes them all the way, served with fresh grated parmesan. Serve this with slices of warm focaccia and a green salad. A sure success. Thanks to Marina for sharing this recipe. You can enjoy Spaghetti Puttanesca, this is a wonderful classic Italian dish. Place the oil and butter in a quart size pan. Add the chopped onion and the "pounded" garlic. Allow to cook over medium heat until translucent. Add the diced tomatoes and the tomato sauce along with the crushed hot peppers. Add the bouillon cubes and the chopped basil. Allow to cook, covered for about 10 minutes. Meanwhile prepare your chopped anchovies fillets, drain the sliced black olives, the capers and slice the snow peas. Add the snow peas and cook for 3 minutes over medium heat. Now add the capers, black olives, anchovies, stir well and serve over cooked, drained spaghetti. Top with grated Parmesan cheese. Buon Appetito! This is a very flavorful sauce!